Between December 2018 and January 2019 our team detected a mixture of different antihistamine drugs in eight different samples that were submitted as alprazolam (both in powder and pill form). For this reason an alert was launched on January 30th. The alert has received more than 4200 visits since its publication on January 30 and has been disseminated in forums such as Dread and Reddit . 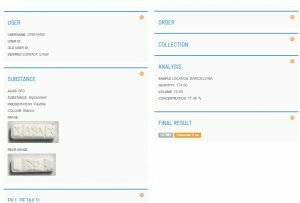 A few days later we launched a free analysis campaign so that people could rule out the presence of adulteration in samples that they suspected were identical to those described in the alert and acquired in cryptomarkets or in online pharmacies. Participants were asked to fill in a questionnaire as a prerequisite for receiving a code, allowing them to send a sample to our offices for analysis free of charge. We received 80 e-mail requests from 1/2/19 to 1/3/19. 35 people answered valid questionnaires and were provided with a code for free drug checking. According to information gathered, samples acquired in cryptomarkets had been purchased in the most widely-used one (Dream Marketplace). The names of three U.S. vendors were frequently repeated. Nevertheless only received 1 sample in our headquarters. The remaining 34 users who provided information in questionnaires did not manage to send any sample. So we did not make public any information as data were inconclusive and we did not collect any adulterated sample through our free testing campaign. In our cryptomarket activity monitoring we detected that one of the three vendors that was frequently mentioned ceased to be active on Dream Marketplace by mid-February 2019. One of the people who sent one of the samples that triggered the alert contacted our team through a forum. He claimed to be a cryptomarket vendor who had sent his sample before offering it in Deep Web and promised not to distribute it. He provided sufficient evidence to verify the information and up to the closing of Dream Marketplace these pills have not been available in his store. 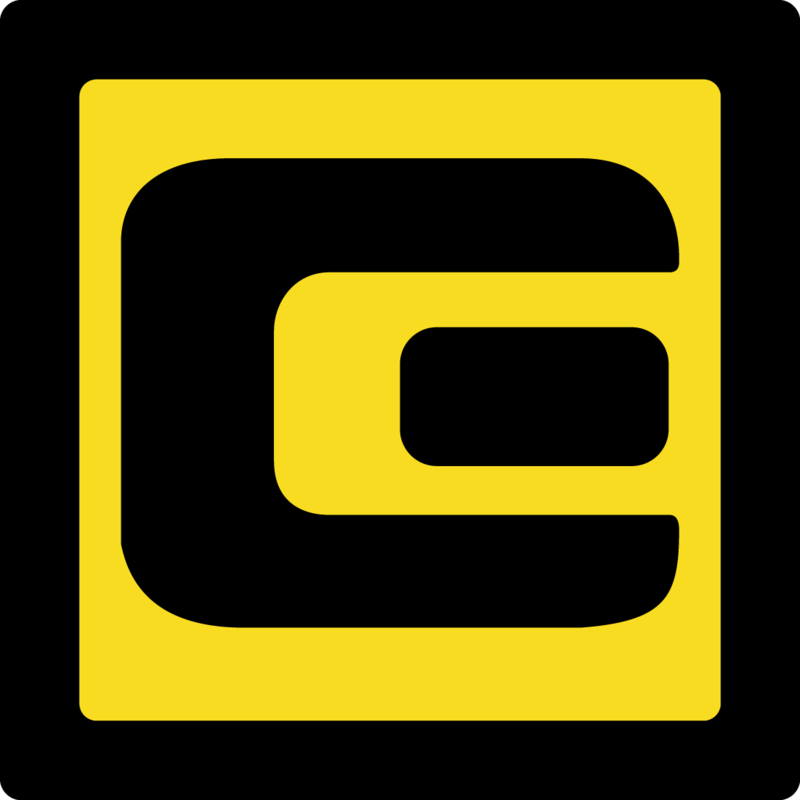 He pointed to “Chinese wholesalers, some of them out of cryptomarkets” as the source of the problem, information that matches with the one provided by two other different users. 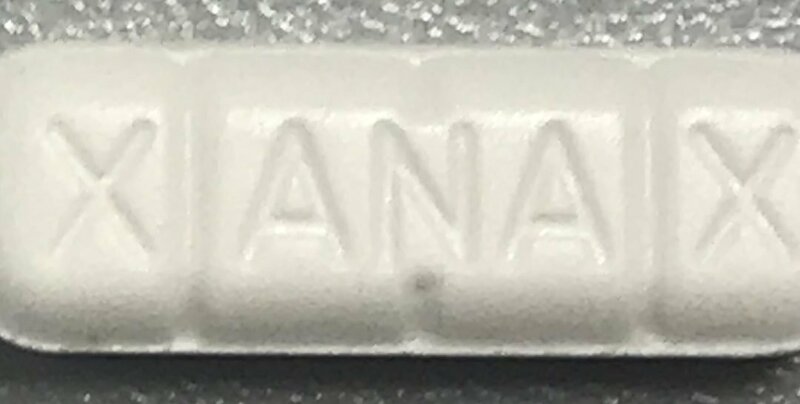 On March 20th we received a sample of Xanax rectangular tablet sent by the DNSTARS community. 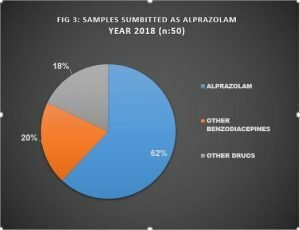 Our analytical techniques ruled out the presence of alprazolam or benzodiazepines, we were unable to clarify their exact composition. 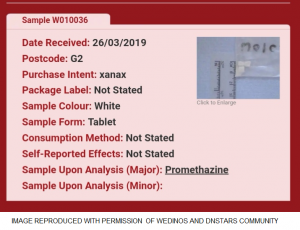 Simultaneously another pill from the same batch was analyzed at Wedinos which revealed the presence of promethazine.They were reportedly purchased via Dream Marketplace from a seller called Benzo Boss (Sample 663/45698/, Sample W010036). It mimics Xanax ® 2mg (commercial Pfizer brand for alprazolam) pharmaceutical grade pills, with a “XANAX”/”2”imprints. 4 powder samples received from Canada, United Kingdom, Portugal and Australia. At least 3 of them were almost certainly purchased in crypto markets. Etizolam is chemically related to benzodiazepines and acts by binding to GABA receptors in the brain. Acute effects, risks and dependence potential is similar to other benzodiazepines. It is marketed in Japan and India but became a popular substitute of other prescription benzodiazepines in the research chemicals Internet markets around 2011. Common dosages are 0.5-2 mg. Like other benzodiazepines, it can cause withdrawal syndrome if its use is stopped abruptly after regular consumption for weeks or months. Our analysis techniques do not currently allow us to quantify etizolam. Using it without knowing its concentration greatly increases the risks, as the variability in purity (especially in powdered forms) can be very high. We hope to be able to quantify etizolam as soon as possible. 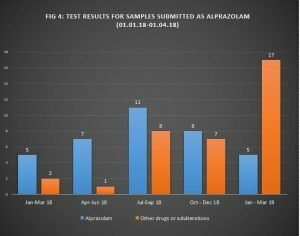 We found flualprazolam as the only active ingredient in 3 samples submitted as “alprazolam”. The pill has the markings GG249 on one side, and is blank on the other. Flualprazolam is a benzodiazepine derivative never marketed. It was detected for the first time in 2018 in Sweden. There is no research data available on animals or humans that could allow us to know flualprazolam’s effects, risks, as well as potential therapeutic and toxic doses. Structurally, the addition of a fluorine molecule in position 2 to alprazolam should increase its potency and duration of effects. But its long-term safety or toxicity profile is unknown. Although it can still be legally obtained via the Internet, consumption of benzodiazepines that have not been tested on humans is not encouraged. We found flualprazolam as the only active ingredient in 1 of the samples submitted as “alprazolam”. The pill has the markings R039 on one side, and is blank in the other. 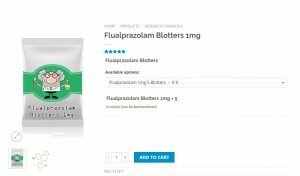 Flubromazolam is a benzodiazepine derivative that contains a fused triazole ring, like triazolam. It has been sold online as a research chemical, and is currently scheduled in several countries. It is very potent, and dosages around 0.25 mg cause strong sedation and sometimes amnesia. Severe adverse reactions have been observed with 3 mg dosage and there are numerous toxicity reports published in scientific bibliography. 4 yellow powder samples submitted from revealed the presence of doxepin. This was detected as the only active substance in one sample (Portugal, code 44537, 28/1/09) , in combination with one unknown substance in one sample (Hong Kong, c 45596, 12/03/19), in combination with two unknown substances in one sample (Canada, 45237 ,20/2/19) , and in combination with atropine and 3 unknown substances in one sample (China, 45694, 19/3/19). It mimics Xanax ® 2mg (commercial Pfizer brand for alprazolam) pharmaceutical grade pills, with a “XANAX”/”2” imprints that contained doxepin as unique substance. Doxepin is a tricyclic antidepressant used to treat major depressive disorder or anxiety disorders. Its use is now rare as it has been replaced by safer and fewer adverse effects drugs. Therapeutic dosages are in the rank of 10-300 mg. Doxepin common side effects include sleepiness, dry mouth, constipation, nausea, and blurry vision. A withdrawal syndrome may occur if the dose is rapidly decreased. It interacts with many other prescription drugs and it is highly toxic in overdosage. The combination in powder (Canada, c 44957, 07/02/2019) or paste (Portugal, c.44538, 27/03/2019) of amantadine, ciproheptadine and prometazhine. It mimics Xanax ® 2mg (commercial Pfizer brand for alprazolam) pharmaceutical grade pills, with a “XANAX”/”2” imprints. After reviewing laboratory data and asking other experts opinion, we have concluded that the unidentified substances that were detected and reported in a few of the samples are artefacts of the analysis process and are likely not organic compounds. It is possible that the antihistamine mixtures that were detected in some samples were intended to mimic alprazolam’s sedative effects. These mixtures act different to alprazolam, however, and can cause severe adverse effects and interaction with other therapeutic or recreational drugs. At least in theory, this combination could trigger severe cardiac arrhythmias, especially in combination with or after using stimulants (methamphetamine, amphetamine, cocaine…). One of the objectives of the Drug Testing Services is to monitor emerging trends and warn about Public Health potential hazards. 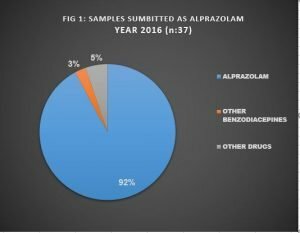 According to our data, adulteration of alprazolam samples from the black market seems to be a relevant and sustained on time problem. Our results are subject to possible biases, as the number of samples is small and their origin is very heterogeneous. However, services similar to our IDCS (such as Saferparty, Ecstasydata or Wedinos) are reporting similar results similar. Information available through Internet forums ( particularly in the Deep Web) supports this idea, also. We ask to Public Authorities to consider the role of Drug Checking Services as useful tools to protect drug user´s health. We will update any relevant information about this phenomenon. Special thanks to Wedinos and DNSTARS community for their collaboration.